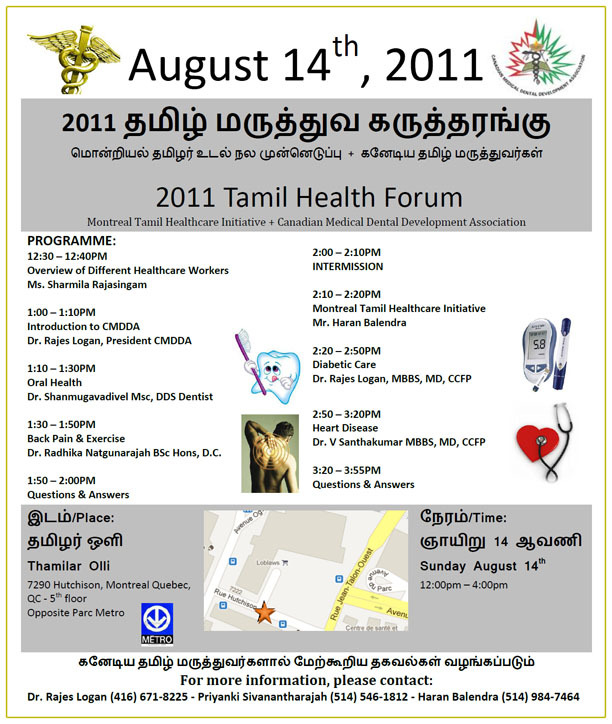 Montreal Tamil Healthcare Initiative + Canadian Medical Dental Development Association are conducting the 2011 Tamil Health Forum in Montreal on Sunday August 14, 2011 -- 12:00 - 4:00 PM. 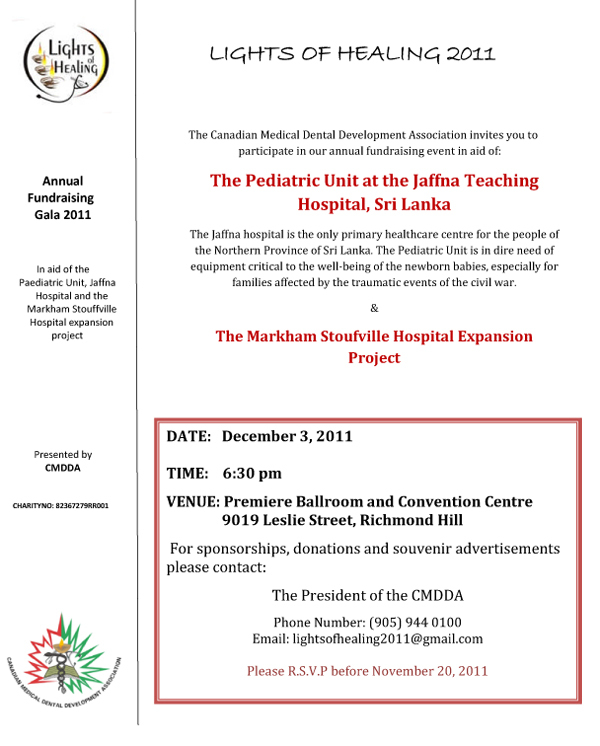 Click here to print the flyer for the event. 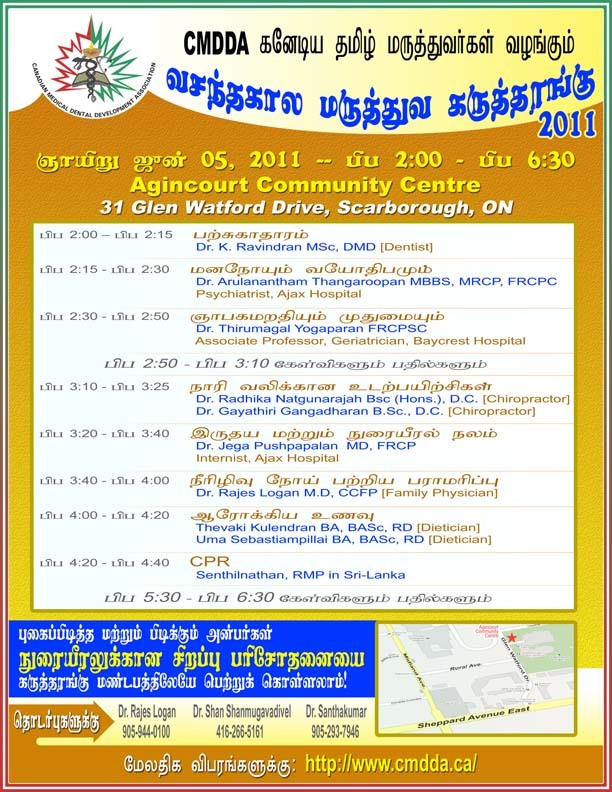 CMDDA is conducting its 2011 Spring Tamil Health Forum Sun. 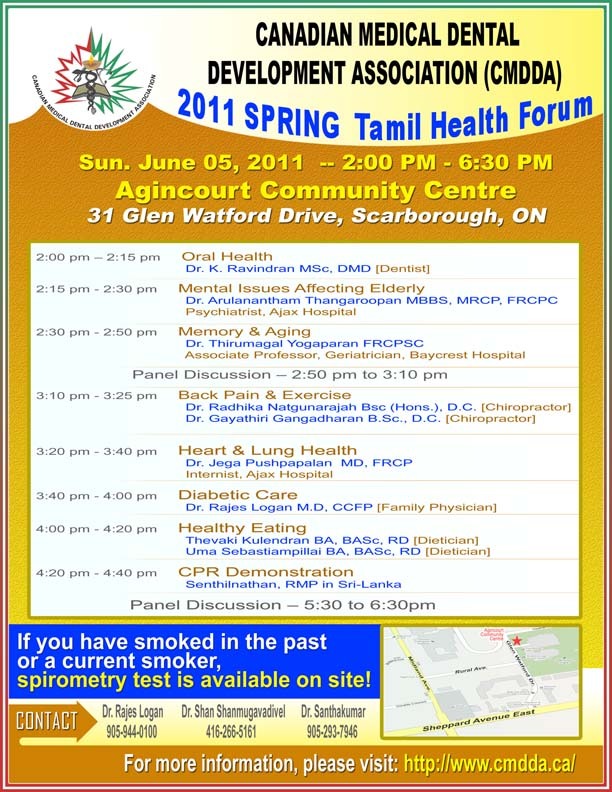 June 05, 2011 -- 2:00 PM - 6:30 PM at the Agincourt Community Centre, 31 Glen Watford Drive, Scarborough. 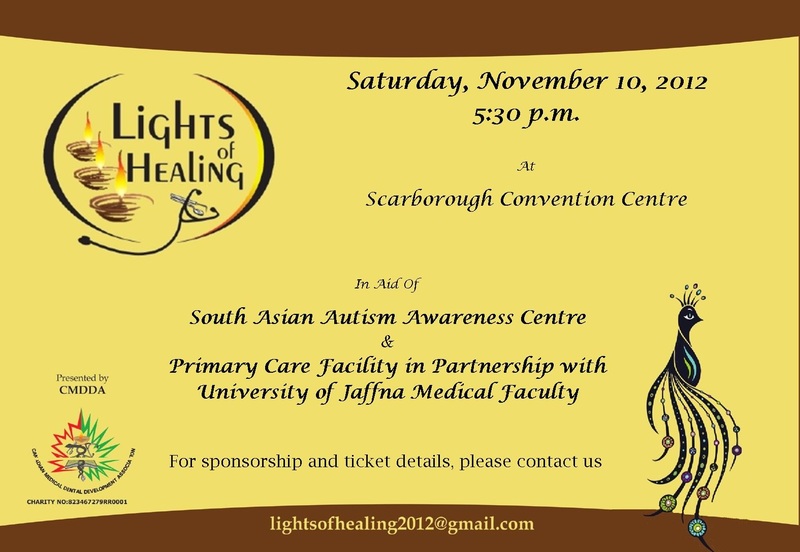 Click here to print the flyer for the event. Ottawa Tamil Seniors Association (OTSA), National Capital Region Tamil Association (NCRTA) and the Canadian Medical Dental Development Association (CMDDA) are coming together to conduct a Health Forum in Tamil to benefit the Ottawa Tamil Community to be held on Saturday, May 28, 2011at 4 PM. 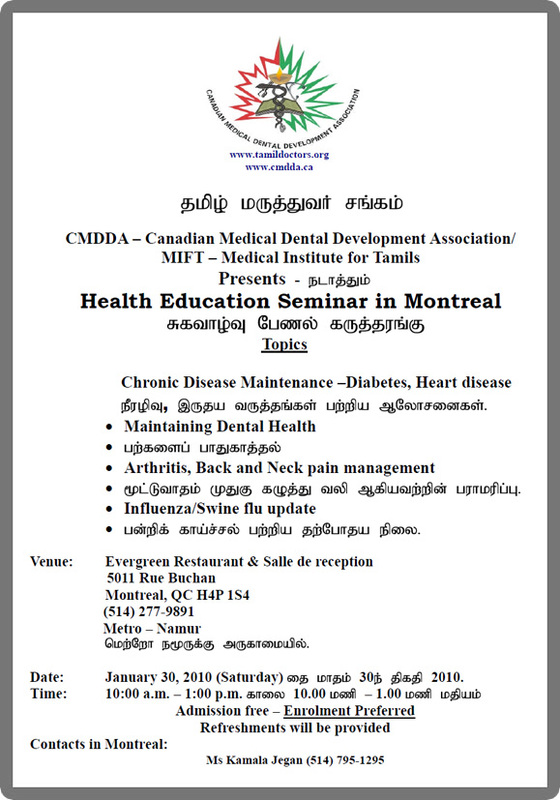 Everybody from the Ottawa Tamil community is welcome for this forum, which will be presented in Tamil and includes the presentations in Cancer Awareness, Back Pain & Arthritis, Diabetic Care, Healthy Eating and Healthy Heart. Please confirm your attendance here/with one of our Board member.we only have two weeks to go. Also at this time I would like to invite nominations for the new Board and encourage all of you to come forward to help us continue our objectives as we move on to the 14th year! Floods in Eastern Sri Lanka has affected over a million people. Over 300,000 have been displaced and the United Nations has called upon the international community to help the victims of the flood recover from this devastation. Eastern Sri Lanka has been victimized by the brutality of war since 1983, and was severely affected by the tsunami of 2004. The needs of the victims are immense and evolving daily. We are therefore seeking your help in raising funds to assist the victims of the flood by donation to the MIFT. CLICK here for more information on the venue. We encourage all of you to attend and help the people affected by the floods generously. 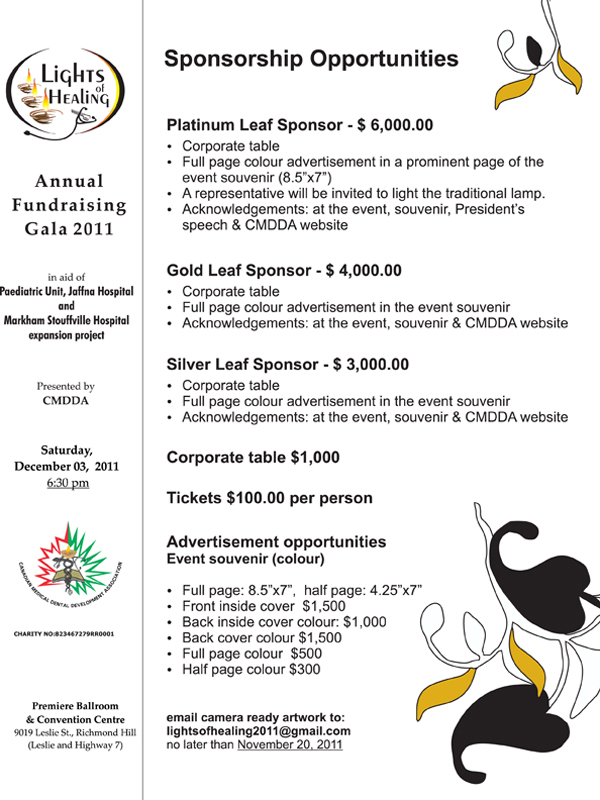 Canadian Medical Dental Development Association is proud to announce the details of our annual fundraiser event for this year - Lights of Healing 2010 Bowlathon on Saturday November 13th. This year our proceeds will be going to the Development of a Tamil wing and Tamil resident meal and other support programs at Seven Oaks long-term care homes (Neilson and Ellesmere) owned and operated by the city of Toronto. As you can see the format of this event is going to be different this year in which you can bring your family/group and bowl, enjoy the dinner and mingle with the group. We invite all of you to join in to support this event to empower lives of our seniors in this home and to pave way to improve long term care access for the Tamil community in the future. Our commitment to support post war rehabilitation in Sri Lanka through MIFT is ongoing. Building a mental health unit in Mannar is the last major project we completed. You are welcome to talk to one of us for project updates back home. We look forward to your support in this venture to make this event successful. Click here to access the our completed events archive. Click here to access Funds and Projects of MIFT. Further information can be obtained from the treasurer.